Though the meaning of this enigmatic effigy is unknown to us... its dramatic form imparts a message of significant power. It has been hypothesized that the form is a reductively blocked interpretation of a bird of prey. Regardless of its intended meaning, this piece stands high for its artistic achievement in Woodlands sculpture. 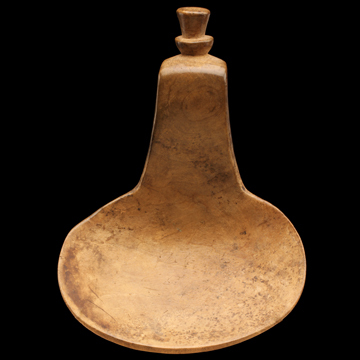 Untouched surface with a dry bowl and a richly patinated handle from hand wear.